Hi there! I have a Christmas card to show you today! 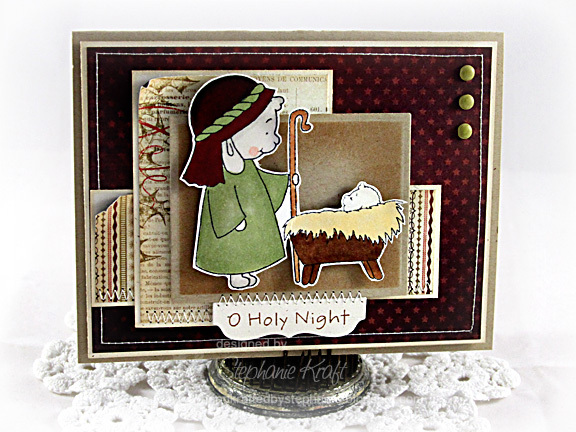 I'm using MFT's newest Precious Little Lamb, Pure Innocence Baby Lamb in a Manger. I also used the latest MFT Wednesday Sketch Challenge #49 for my layout. I started by stamping, coloring and fussy cutting this sweet image. Next, I stamped my sentiment onto one of the new Die-namics Mini Tabs Foursome dies and stitched it onto my image panel. I love the variety of tabs and these smaller ones are perfect for shorter sentiments like this one. My SIL, Mary, loves lambs, so this (and likely all of my Precious Little Lamb creations) will be for her. Accessories: Die-namics Mini Tabs Foursome, Die-namics Framed Greetings (My Favorite Things); Classic Rectangle Nestabilities (Spellbinders), Markers (Copic), Brads, Foam tape, Thread, Sewing machine. Oh my goodness Stephanie! What an adorable card! This card screams cuteness! Surely your SIL will LOVE it! So pretty! Love the image cut out that way! Stephanie, this card is DARLING!!! You fussy cutting is incredible! BEAUTIFUL Steph! I used this set for this sketch too!!! This is stunning. Totally gorgeous coloring!! Lots of inspiration here!! So beautiful Stephanie!!! 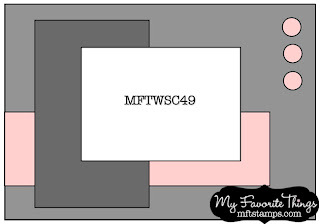 Love the rich colors!! !